The way out? Reduce global carbon emissions by 6% each year and manage the biosphere such that it draws carbon down to 350 ppm levels or below through the early 22nd Century. To Hansen and colleagues this involves a scaling carbon fee and dividend or a similarly ramping carbon tax to rapidly dis-incentivize carbon use on a global scale. Do that and we might be relatively safe. Safe, at least in the sense of not setting off a catastrophe never before seen on the face of the Earth. That’s pretty good news. Pretty good news when we consider that some of the best climate scientists in the world see an exit window to a hothouse nightmare we’re already starting to visit upon ourselves. The bad news? According to Hansen and colleagues, even if we just continue to burn fossil fuels and dump carbon into the atmosphere at a ‘moderate’ pace some of the terrifically catastrophic impacts of human caused climate change are not too far off. The new Hansen paper takes a look into both our geological past and our climate future in an attempt to give us an idea what may be in store. In this scenario, model, and paleoclimate based study, Hansen and colleagues assume two things about global human civilization. The first assumption is that we don’t follow the worst case, business as usual carbon emissions policies that lead to around 1000 ppm CO2 in the atmosphere by 2100. It is instead assumed that some effort is given to reducing coal, oil, and gas consumption. That some renewable energy, increased efficiency and behavior changes replace a significant portion of future fossil fuel emissions. But the most effective solution — a complete transition away from fossil fuel burning over the next few decades — fails. As a result, we end up with around 700 parts per million carbon dioxide in the atmosphere by 2100. In such a case we’ve followed what the IPCC community terms as the A1B or ‘moderate’ fossil fuel emissions scenario. It is in this context that the Hansen paper attempts to determine a key factor that will have wide-ranging impacts on ocean health, the continued existence and lifespan of coastal cities, and on the severity of the weather itself. That factor is captured by a single simple question — if we continue a moderate pace of fossil fuel burning, then how rapidly will ice sheet and ice shelf melt double? To Hansen this is a critical question. One he has already done quite a bit of work to answer over recent years. And according to his findings it looks as if land ice melt rates for both Greenland and West Antarctica could now be doubling every 5-20 years. It’s a doubling rate that may find a historical allegory in the milder yet still intense glacial outflows of times long past. And it’s something that, according to Hansen, is being directly driven by an extreme pace of human-based greenhouse gas accumulation. To this point, Hansen’s new paper takes a dive into the paleoclimate study of an ice age interglacial that bears some stunning similarities to our own, human warmed, time period. He looks at the Eemian, a warm period that occurred 130,000 to 115,000 years ago. A period that featured temperatures in the range of 1-2 C above 1880s values (we’re in the process of hitting 1 C above 1880s values this year). A period in which CO2 levels were in the range of 285 parts per million (about 15 parts per million higher than the Holocene average before humans spiked that level to 400 parts per million during recent years). And a period that, according to Hansen’s broad study of past research, included numerous Heinrich type glacial outburst and melt events. Back then, at 285 parts per million CO2 levels, seas were as much as 5-9 meters (16 to 30 feet) higher than they are today. The global climate, on the other hand, was much stormier. 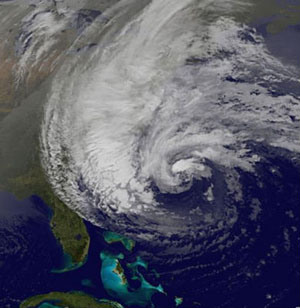 For two Heinrich type events that Hansen investigated were found to have dramatic impacts on severe storms in the North Atlantic during the Eemian. Hansen found large boulders propelled up onto the islands of Bermuda and the Bahamas by what appear to be powerful storm waves. Hansen also noted chevron shaped wave channels carved into the calcified sand beds in the Bahama Island Chain. It paints an overall picture of very stormy weather in the North Atlantic as a result of these Heinrich ice sheet melt episodes affecting Greenland and West Antarctica. These melt events drove fresh water out into the North Atlantic and the Southern Ocean at the rate of about 0.5 to 1 meters of sea level rise per century. 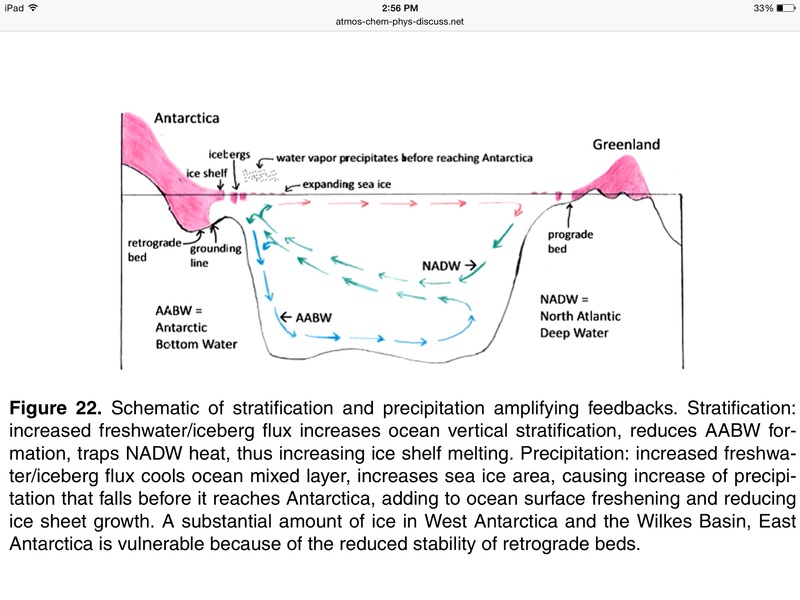 The expanding cold, fresh water along the surface zones in the upper latitude waters shut off heat exchange between the ocean and the atmosphere by generating a stratified ocean state. This fresh water wedge interrupted the plunging of heavier, salt-laden waters in the North Atlantic and the Southern Ocean. 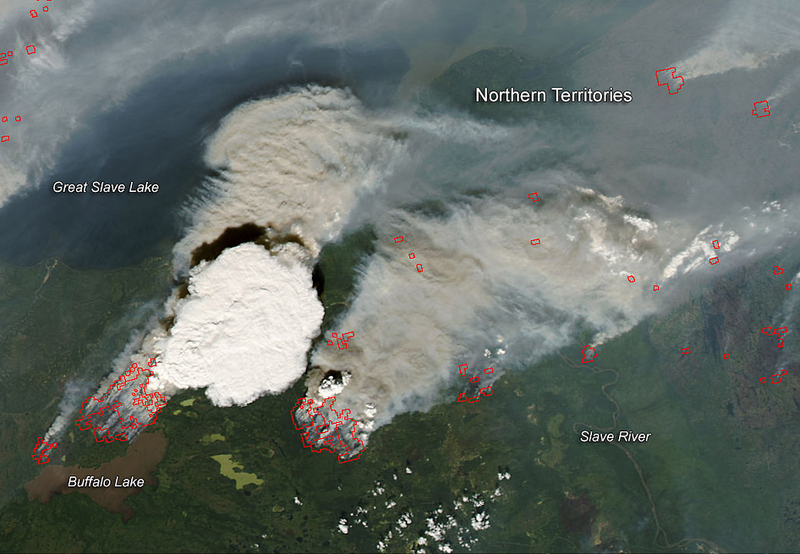 A loss of heat exchange that resulted in the cooling of airs directly over the fresh water outflow pools. Meanwhile, since heavy, saltier waters were no long diving to the ocean bottom in these regions — broader ocean circulation was interrupted. As a result, heat from the equator was no longer traveling poleward. The equator warmed. The cold, fresh water outflow regions cooled. And this high temperature gradient subsequently became a powerful storm generator — providing extreme baroclinic potential energies for the storms that likely reshaped the ocean bottom and deposited massive boulders upon islands throughout the North Atlantic. It’s worth noting that the 5-9 meter sea level rise during the Eemian occurred in the context of global temperatures that are now similar to our own (1-2 C above 1880s values). But it’s also worth considering that the underlying CO2 and greenhouse gas conditions for the current age are far, far worse. Peak global CO2 during the Eemian never hit higher that 285 parts per million. 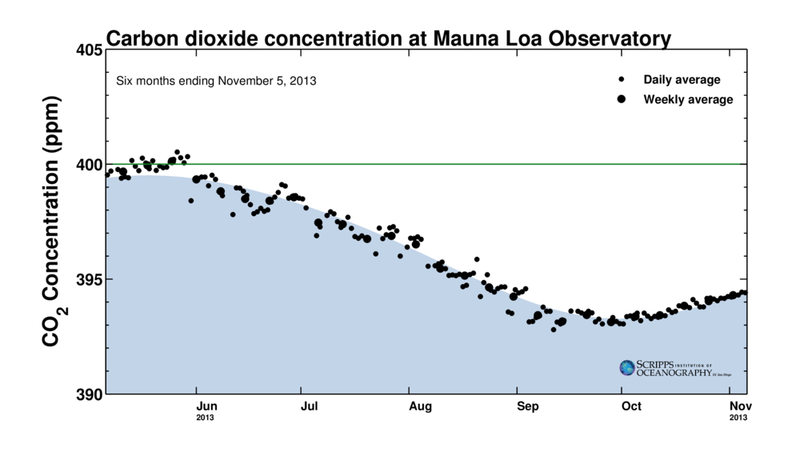 For the Anthropocene age we are now leaving the 400 parts per million CO2 level in the dust. Meanwhile, the pace at which we are warming is also more than 10 times faster than the pace of warming to peak Eemian heat values. And it’s these two factors — an extreme greenhouse gas overburden combined with a very rapid pace of warming that has Hansen and colleagues very concerned about our climate situation over the next 10-80 years. Turning to the current day, there’s a growing number of reasons why we should be concerned that rapid land ice melt, large fresh water outflow to oceans, and resulting superstorms could be in our future. First, we’ve learned that the topography of Greenland and Antarctica include numerous channels that tunnel deep into its great glaciers at depths well below sea level. 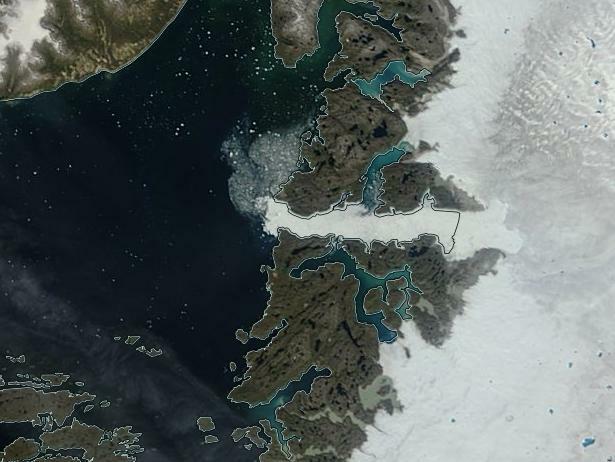 When oceans warm, and they’re warming as you read this, the submerged, sea-facing slopes of glaciers are confronted with more and more heat gnawing away at their under-bellies. Just a 0.1 C increase in water temperature can melt away a meter of ice over the course of a year. 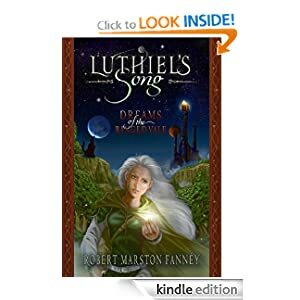 Multiply that by glaciers with faces that are submerged hundreds of feet deep whose sea fronting cliffs extend for many miles and you can end up with quite a lot of melt due to very little warming. As more of the undersides of glaciers melt, more of the water tunnels inland and large masses of ice are rafted away from the central ice exposing still more of the land anchored ice to a warming ocean flood. As bad as this dynamic may sound, the process includes one more wrinkle that makes it even worse. As the undersides of ice shelves erode and more fresh water laden ice bergs are pulled out into the ocean, these ice bergs begin to melt en mass. This massive ice melt develops into an enormous and expanding pool of fresh water at the surface. And its this troublesome demon that traps heat in the deeper ocean levels. So, in other words, as the ice from the land glaciers floats away and melts it traps and focuses more heat at the base of these great glaciers. It’s an amplifying feedback. A very serious kind that doesn’t even require the human forced kick to create severe trouble. One that during the Eemian really wrecked the weather and caused massive surges in ocean height. It’s a process that Hansen and his colleagues believe make both Greenland and West Antarctica very vulnerable. A process that could, when combined with the high velocity human heat forcing, produce melt rates that double every 20, 10 or even every 5 years. But of the two — Greenland or Antarctica — which is worst off? Greenland, for its part, is little more than a great Archipelago held together by its stunning ice mass. 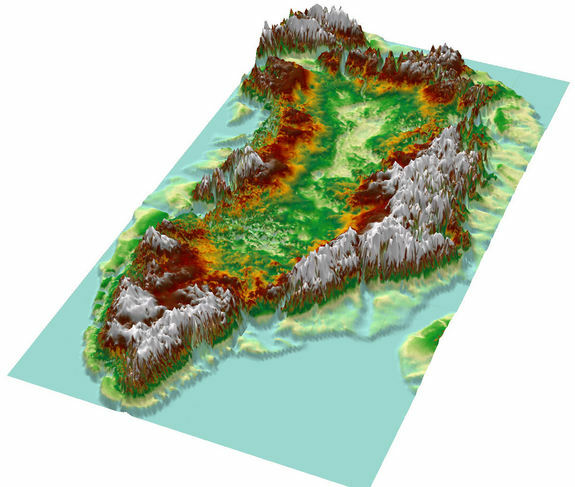 Remove the ice and the interior of Greenland would flood, leaving a ring of islands as a final remnant. Though deep, most of these channels run up slope. And this feature, according to the Hansen study, may be one saving grace for potential Greenland ice melt pace. Up slope channels limit the impact of basal melt by serving to check rates of catastrophic destabilization. So though Greenland is certainly vulnerable to ice melt due to the fact that many channels cut hundreds of feet below sea level and into the island’s glacial heart, it is not as vulnerable as West Antarctica. There, many channels cut deeper beneath the Antarctic ice mass. But not only are they below sea level by hundreds of feet as with Greenland, they slope down. They slope down and not for just a little ways under the ice sheet — some of these ocean heat skids extend in down-sloping fashion for hundreds of miles beneath the Antarctic ice. The result is a kind of skid, that once unlocked by initial melt, can continue to expose larger and large chunks of bottom ice to the warming ocean. Allowing, ultimately, the creation of new warming seas underneath the ice and floating it away in very rapid fashion. In West Antarctica, ice shelves facing the Weddell and Ross seas both feature these dangerous retrograde slopes. In East Antarctica, the Totten Glacier is likewise vulnerable as are many other glaciers surrounding the vast periphery of Antarctica. Finally, in addition to being surrounded by the warming, deeper waters of the Southern Ocean, in addition to featuring dangerous retrograde slopes that channel warming sea water further and further inland and beneath the ice sheets, West Antarctica itself sits on a geological hot bed. Though not mentioned in the Hansen study, recent work also highlighted that West Antarctica rests atop a geologically active zone that had formed numerous sub-glacial lakes warmed by geological activity. This added geological heat makes West Antarctica that much less stable — an instability that when given the shove of human heated oceans is leading the Larsen B Ice Shelf to completely collapse by 2020. It makes Antarctic land ice that much more vulnerable to the added heat human beings are forcing into the oceans and opens up the ominous possibility that melt rate doubling times for West Antarctica could become quite extreme indeed. So what does all this mean? In the worst case (5-10 year melt rate doubling times), it’s possibly 3 meters of sea level rise by mid Century, perhaps 7 meters by end Century under business as usual fossil fuel emissions. Even in the more moderate cases (10-20 year melt rate doubling times), 1 meter of sea level rise by mid Century and 3 meters or more of sea level rise by end Century is not entirely out of the question, according to Hansen’s new research. 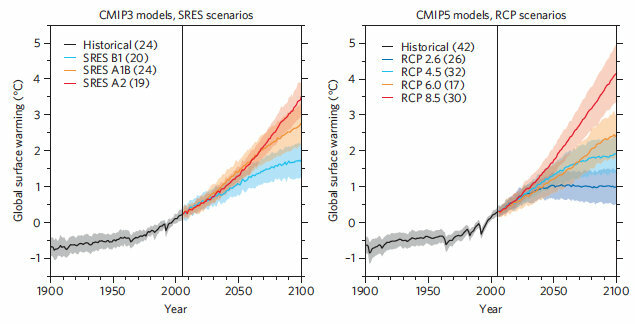 These potentials are markedly different than the more conservative rates outlined by IPCC which is still calling for a less than 1 meter sea level rise under even the worst case human carbon emissions scenarios (1000 parts per million CO2, in the range of 1200 ppm CO2e). So much fresh water hitting the oceans would cause a rapid stratification. A rapid loss of ocean to atmosphere heat exchange in the regions impacted. A train wreck of heat backing up at the equator. Such a train wreck would result in temperature extremes and gradient differences that would make the Eemian Heinrich events (mentioned above) seem moderate and slow by comparison. Hansen has been working on global atmospheric models for tracking these events for a number of years now. And this new study is an improvement on his earlier, model-driven “Storms of My Grandchildren” work. Hansen’s new model runs are imperfect simulations of what may happen given large melt pulses from Greenland and Antarctica. The models, according to Hansen, mix the ocean water too much, reducing the overall impacts of stratification through the mechanism of the fresh water wedge. However, even with this imperfection, the temperature gradients displayed by these models are absolutely stunning. A clear warning to anyone who still wants to keep burning fossil fuels that they’re really grabbing the dragon by the tail. In the above image we can see just one of these model runs. 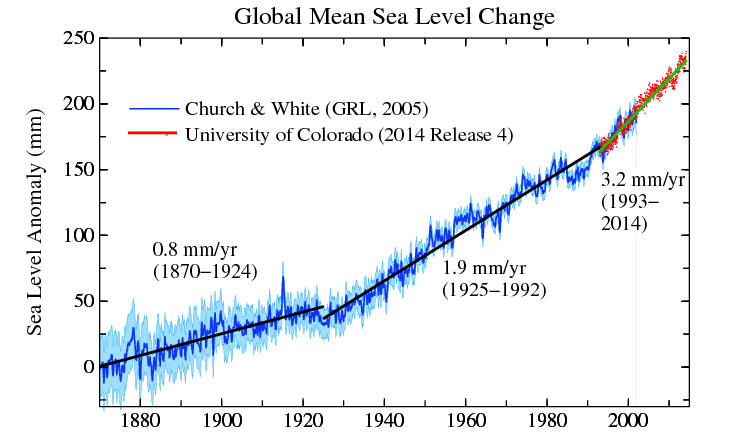 The model assumes a 10-20 year doubling time for rate of land ice melt. It contributes equal portions of melt from Greenland in the north and Antarctica in the south. Greenhouse gas accumulation is considered to be along the moderate case A1B track. By 2080 we have about six feet of sea level rise globally and about 600 parts per million CO2 in the atmosphere. The more rapid rate of melt has put a temporary damper on the rate of global atmospheric warming which has dipped to 1.11 C above 1880s values (just slightly higher than today). But much of this cooling is localized to the Southern Ocean and to an extreme cold pool in the North Atlantic between Northwestern Europe and Greenland. There a massive outflow of fresh water has shut down the ocean’s ability to exchange heat with the atmosphere. AMOC has been vastly weakened. The Gulf Stream is backed up along the US East Coast and into the Gulf of Mexico. Heat is building in the Arctic opposite Greenland and all along the Equator. Temperature anomalies in the range of 17 degrees Celsius below average occur over the ocean fresh water pool. This drop is enough to generate year round winter like conditions in the cold pool region even as other sections of the atmosphere around it continue to warm or retain severe excess heat. Energy imbalance at the top of the atmosphere rockets to between 2 and 4 Watts per meter squared. What this means is that, in failing to ventilate heat to the atmosphere in the North Atlantic and Southern Ocean, the world ocean system has continued to accumulate a massive amount of heat. Heat that is now going to work warming the ocean bottom and hitting the bases of the already rapidly melting land ice. For the North Atlantic, it is the greatest of understatements to say that an area of perpetual winter surrounded by warming airs and sitting atop a warming deep ocean is a major storm generator. 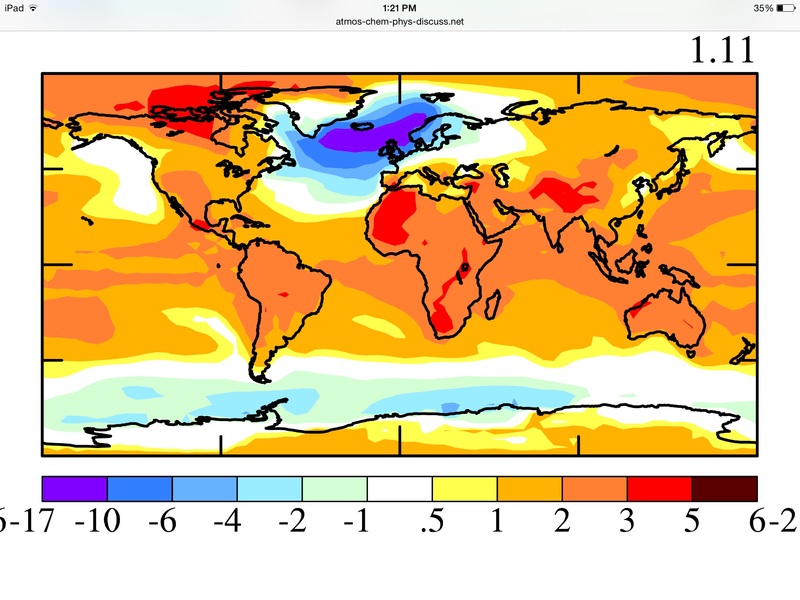 Summer time temperature deltas between the center of the cold pool will range from near zero C to 20s, 30s and 40s C over nearby ocean and continental land masses. It’s like taking the High Arctic and shifting it to Scotland while all the adjacent airs warm. Temperature gradient and baroclinic (pressure gradient) energy for storm generation will be on the order of something that modern humans have never experienced. The potential for superstorms in this model simulation will, notably be quite high. The point to consider here is that large scale land ice melt sets in place forces that result in a weather wip-lash of epic proportion. It’s been the heart of Hansen’s work for many decades and it’s an issue that we really need to consider as time goes forward. A dwindling time for response that may well be much shorter than even Hansen’s models indicate. First, ice sheet vulnerability may well be higher than IPCC officials imagine and we could well be on a slope of melt rate doublings in the range of 5-20 years now. Second, Hansen’s models likely capture the atmospheric impact of such large-scale land ice melt later than would happen in the real world. This later capture is due to the fact that his low resolution models mix the ocean heat more with the atmosphere than would occur under the kinds of ocean stratification events that we are likely to see due to these doubling times. Third, and finally we return again to the paleoclimate time of the Eemian where there is ample evidence that a mere 0.5 to 1 meter per century rate of sea level rise due to melting Greenland and West Antarctic ice during that time set in place conditions to generate superstorms with high enough peak intensity to deposit massive boulders upon islands in the Atlantic and to carve the impression of gigantic, long-period waves into the sea bed. Anyone reading this work and considering the notion that some of the greatest scientific minds this age has birthed could be right is immediately confronted with the realization that the gargantuan forces we are playing with are not to be trifled with. And yet, the trifling continues despite the wise and well considered scientific warning to relent. For decades, science has been unable to nail down how clouds might change with human warming of the climate. Sure, we knew that added water vapor through a heating-increased amplification of the rate of evaporation and precipitation would likely impact cloud formation. But how would those physical alterations impact climate? Would an added darkening of the Earth through increased cloud cover provide a cooling effect and slow down the rate of human-caused warming (also called a negative feedback)? 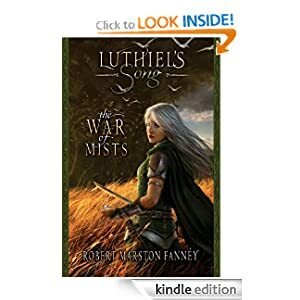 Or would the added water vapor aloft, itself a powerful greenhouse gas, provide an extra boost to the human heating engine (also called an amplifying feedback)? The mainstream climate models thus assumed a zero to slightly positive heat feedback from clouds and relied on decadal verification runs to help test for accuracy. A kind of backwards checking that excluded values from clouds due to a lack of needed information. It was an uncertainty hanging in the very air above us. An uncertainty many climate confusionists used to sow doubt over a broad range of issues involving how sensitive the Earth is to the human heat forcing. They often argued, through this scientific dim spot, that climate sensitivity was, indeed, quite low and that we had very little to be concerned about regarding an immense dumping of heat trapping gasses into the atmosphere that is now at least 6 times faster than at any time in the deep history of life on Earth. The shady clouds, in other words, would save us from ourselves. Not so fast, said Dr. Andrew Dressler who in this paper and this paper recently defended consensus climate science from the cloudy claims of confusionists. Dressler, like mainstream climate science, assumed at least a small degree of positive feedback from changes to clouds and atmospheric water vapor loading. And his observational findings were consistent with an equilibrium climate sensitivity (ECS), or a one century rate of warming, in the range of 2.0 to 4.5 degrees Celsius for each doubling of CO2 (consistent with a multi-century warming [ESS] in the range of 4 to 9 C for each doubling of CO2 — or about a 6 C average). But now, a new study has found that the picture is not quite so rosy as some claimed. The study, led by Dr. Kevin Trenberth, found that net changes to clouds and related additions of water vapor to the upper atmosphere is a positive or amplifying feedback to human caused warming. In other words, the way human heat alters clouds and the related hydrological cycle results in yet more heat being trapped by the Earth System. This confirms Dr. Dressler’s work and raises a rather unpleasant question — if we have an added heat feedback from clouds under a regime of Earth Systems warming, then how strong is it? What we do find is that if one looks at tropospheric average temperature rather than surface temperature, then there is a much stronger relationship with energy flow at the top of the Earth’s atmosphere. We are able to find a water vapor signal that is clearly a positive feedback. This is somewhat unhappy news. What it means is that the Earth System is at least as sensitive as climate models suggest. But, even worse, there is a chance that the Earth System may be closer to the upper range of climate sensitivity estimates. It means that accumulation of heat in the atmosphere, in glaciers and in the ocean may happen somewhat faster than consensus models predict and that geophysical changes may, consequently, be greater and more catastrophic. Whether model simulation of climate sensitivity will need to be altered has not, as yet, been determined. The study is now very new and it will take some time for the more recent data to wash out in the model projections. But what can be plainly stated is that fossil fuel industry funded voices of false comfort have again been proven dreadfully wrong and that there is some risk that the situation may be even more dangerous than current science anticipates. As such, there is absolutely no reason for further delays in policy action and a very rapid draw-down to zero human carbon emissions.